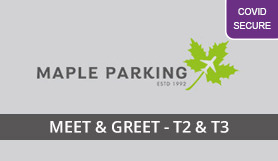 Heathrow Maple Parking Meet & Greet serving T2 & T3. Maple Parking (previously ACE / Maple Manor) is an Approved Heathrow parking company that offers first rate meet and greet parking services for Heathrow Airport. Maple Parking are located in close proximity to Heathrow Airport. Let them take the hassle out of airport parking by meeting you at the airport within the short stay undercover car park in special facilities provided by Heathrow Airport ensuring you can exit from your vehicle in safe, weather proof surroundings - then meeting you back in the same location when your return flight arrives back to Heathrow. BPA Member: A membership scheme that is national recognised and available to all car park companies that join and sets industry standards for quality control. This product is for both drop off and collection at T2 and T3 only. Your return terminal can be amended directly with Maple Parking however this must be amended prior to the day your booking starts by contacting them after you have booked. Extra charges can apply if not T2 or T3. Special offer. Maple Parking will arrange the Levy Fee needed, all customer costs covered in booking price. Airport exit fee is included in the final summary price. This service was previously known as ACE Parking / Maple Manor Parking. If your actual stay is longer than your booked stay, any extra days will be charged at £20.00 per day (or part day). No refunds will be issued for part used stays. Payments for extra days must be settled before the vehicle is handed over and if requested a receipt can be sent by email to you. It is the responsibility of the vehicle owner/customer driving to ensure that the vehicle is roadworthy, holds a valid MOT certificate and has a valid Road Fund Licence. Vehicles that are not road legal or safe to drive will be refused. You will be given the option to drive your vehicle to our car park for storage and you will have to make your own way to us on return to collect it. No refunds will be given for illegal vehicles not collected. Please read your instructions carefully before you set out as they have recently changed. To improve our service to you, you no longer need to call when you are on your way to Heathrow Airport. Please follow the directions below to the meeting point at the terminal you are flying from. You will need to have ready your 'Booking Name' and 'Booking Reference' and return flight details to check with our team when you arrive. TERMINAL 2 - (Postcode for Terminal 2: TW6 1EW). After passing through the tunnels (Tunnel road) into Heathrow Airport, follow signs for Terminal 2 Short Stay Car Park. Take the right hand lane and pass under the 2.2M height restriction, follow signs for ‘Level 4’ and ‘Off Airport', keep right and take a ticket from the furthest right-hand Ticket Barrier (please hand this to our driver). Drive straight forward following signs for ‘Off Airport Parking’. Park in one of the ‘Off Airport Meet & Greet’ parking bays in rows A or B. After passing through the tunnels (Tunnel road) into Heathrow Airport, follow signs for Terminal 3 Short Stay Car Park At the entrance barrier, take a ticket (please hand this to our Handover Captain ) Drive up to level 4 Park in one of the ‘Off Airport Meet & Greet’ parking bays. There is no need to call us on your return. As long as we have your correct return flight number, terminal and return date we will have your car brought to the meeting point below, ready for when you arrive. If you are unsure or did not give us a return flight number when you checked in, then call our handover team. They will be able to advise the status of your car and get it on its way to the meeting point if it is not already. Please have the unique barcoded card that you were given on arrival to collect your keys from our Handover team. If you do not have this then we will need to see and take an image of your passport – which (of course) must match the booking name. Please follow signs to your desired terminal, and use the arrival instructions.